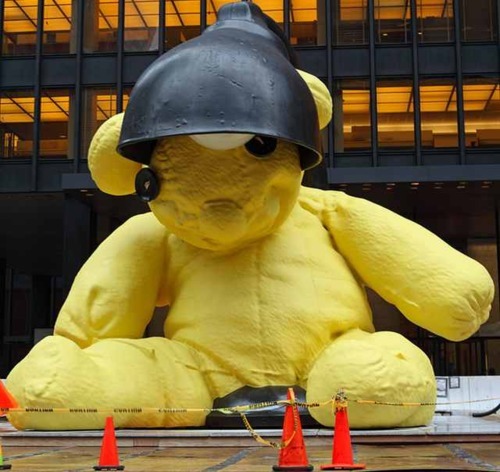 The giant yellow bear that has plopped down on Park Avenue for several months has spent its last day here. This eye-catching oddity was created by Swiss artist Urs Fischer, and reportedly weighs 35,000 pounds. For my daughter Sophia, the yellow bear has become a regular sight on her morning walks. Today we had to say goodbye to yellow bear and the security guards that we've befriended these last few months: Dennis, Rasheed, and Carmelo. It's amazing how weird Seagram Plaza feels without these individuals - and without the giant bright yellow sculpture. For decades the Plaza was defined by open concrete space, flanked by two fountain depots. But in just a few short months, the bear and those guarding him have come to be a normal, even welcome sight. At least from Sophia's perspective. What a beautiful memory your daughter will have about walking with her dad and seeing The Yellow Bear. Thank you for reminding us about the important things in our transient lives, Calvin. Thanks pvb. There's a lot to learn from kids!